Rajdhani Restaurant is a well known restaurant chain from India. Recently, it opened an outlet in Dubai. Having dined at Rajdhani’s Bangalore outlet in India, I was looking forward to visit their newly opened branch in Dubai. Located in the busy district of Karama in Dubai, it is easy to locate the restaurant. As we visited the restaurant during the weekend, the restaurant was busy and it took us 5 minutes to get a table. If you ever plan to visit Rajdhani, make sure to skip a meal before going, as you will be offered a lot of food to eat. Well, that’s what I did! 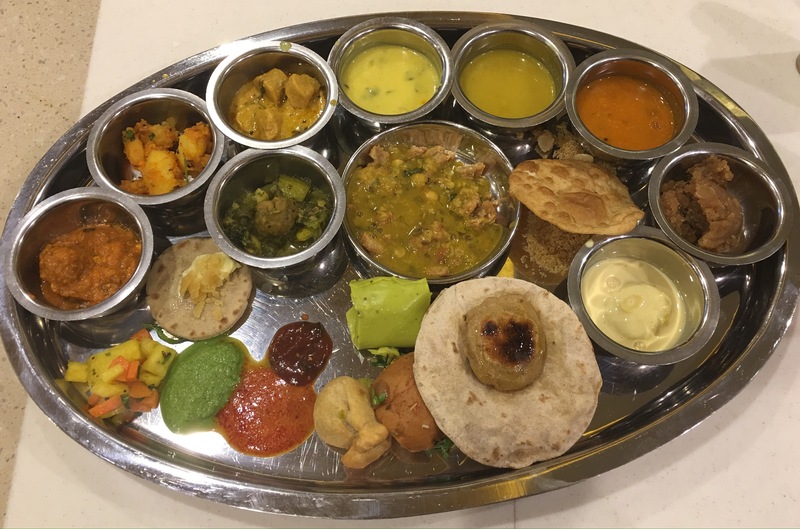 The word Thali translates to plate, specifically referring to a round stainless plate with little bowls consisting of a wide variety of dishes. Appetizers, main course and dessert is served together. In India, each and every state has it’s own Thali based on it’s regional cuisine. Many places offer 2 kinds of Thali- vegetarian and non vegetarian. Rajdhani offers vegetarian Rajasthani and Gujarati Thali. Rajasthan and Gujarat are Indian states located in the western part of India. The Restaurant is spacious with ample seating area. It has Indian inspired decor. At Rajdhani, the menu changes every day and the Thali is unlimited. It includes a welcome drink and Chaas, salad, starters, special of the day, vegetables, dal, kadhi, Indian breads, rice and desserts. The meal was accompanied by condiments like pickle, chutney and Papad. As our welcome drink, we were served Litchi Sharbath. We were also offered Chaas, an Indian drink made with buttermilk. Refreshing carrot pineapple salad was served next. We were served 3 delicious starters-khandvi, kachori and masala pav. Popular Rajasthani dish dal baati churma was the special dish of the day. It was such a treat to eat this delectable dish. There were 4 kinds of vegetables like aloo jeera, paneer makhani, undhiyu and methi gatta. The 3 varieties of dal were toovar dal, Gujarati dal and white bhopla kadhi. We were served a variety of Indian breads like puri, phulka, puranpoli and jowar rotla. As for the rice there was plain rice, Khichdi and corn peas pulao. Moong dal halwa, Rasmalai and malpua were the 3 desserts in our Thali. Most of the dishes we tried were fresh, tasty and flavorful, I must say it is really good vegetarian food. The service is outstanding and the pricing is affordable and reasonable.